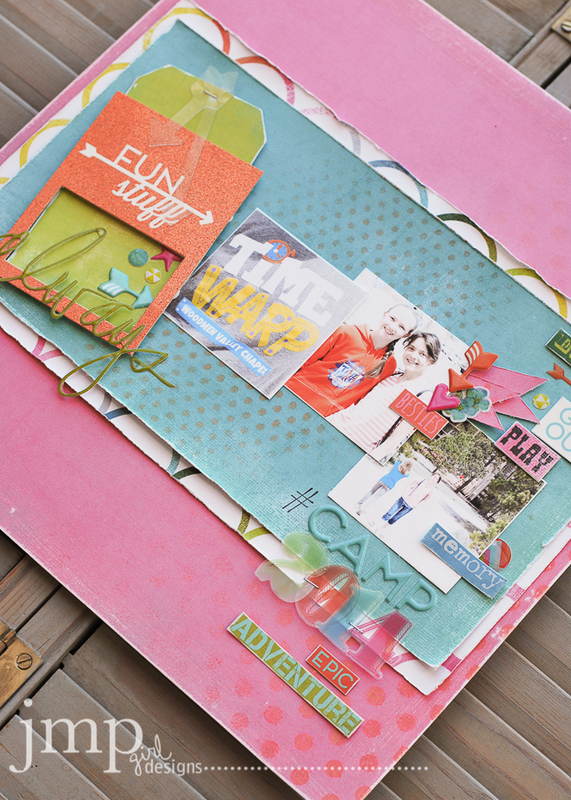 that said...i grabbed up this yummy assortment of color and hue and created this layout for my daughter and her first official camp weekend. 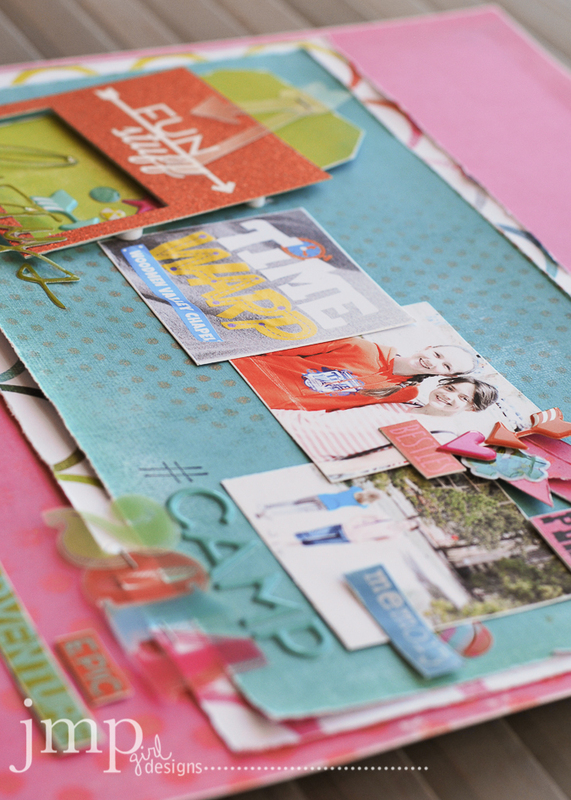 my go to colors are not usually bright and whimsical like what favorite things shows off. but i have really enjoyed the many projects that have been created with this line. let me show you what i am lovin' on this project right now. i have always adored words. if you have been around for awhile, you remember those word stickers that Making Memories had out. I LOVED THOSE!!! 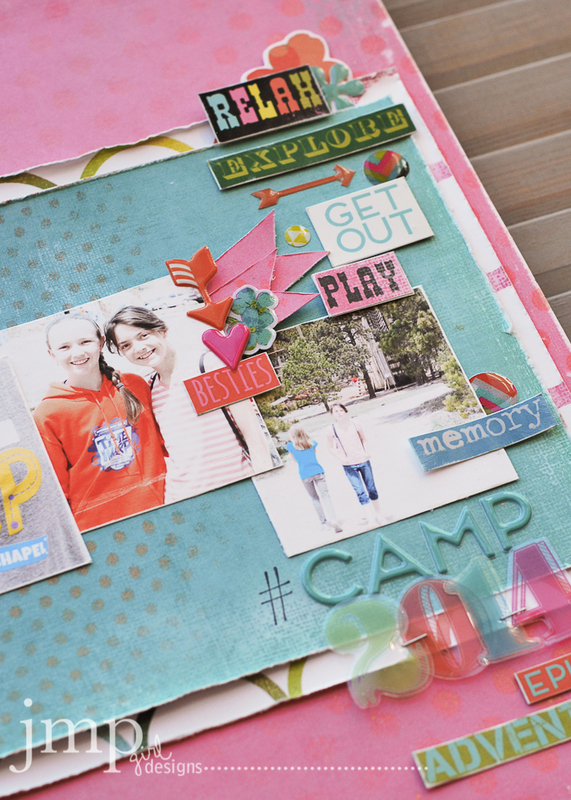 and these Jumble Word Stickers are the perfect way to add plenty of sentiment and tell a story like this camp weekend story. i like to sand their edges cause i like that distressed look. works perfect with the whole feel of this page happening here. 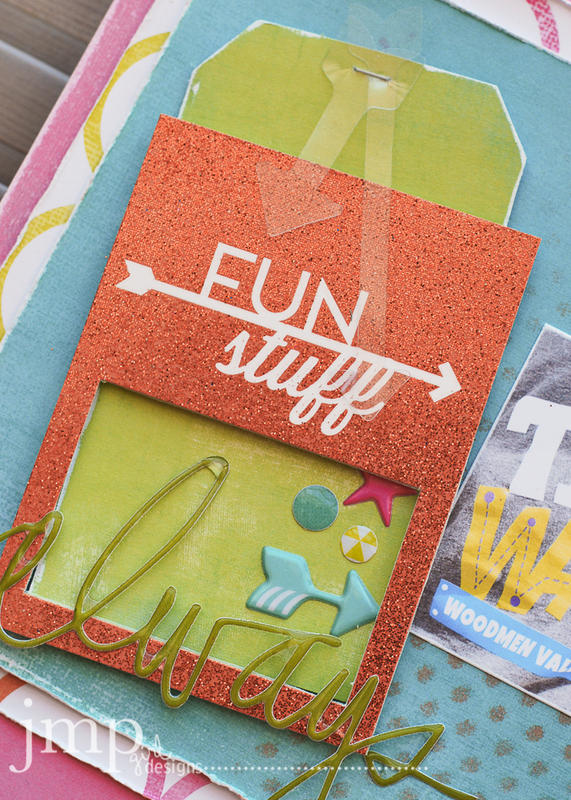 another part that i enjoyed putting together was using the Glitter Frame as a pocket for some journaling. foam dots were placed on the back allowing room for the tag to move in and out. 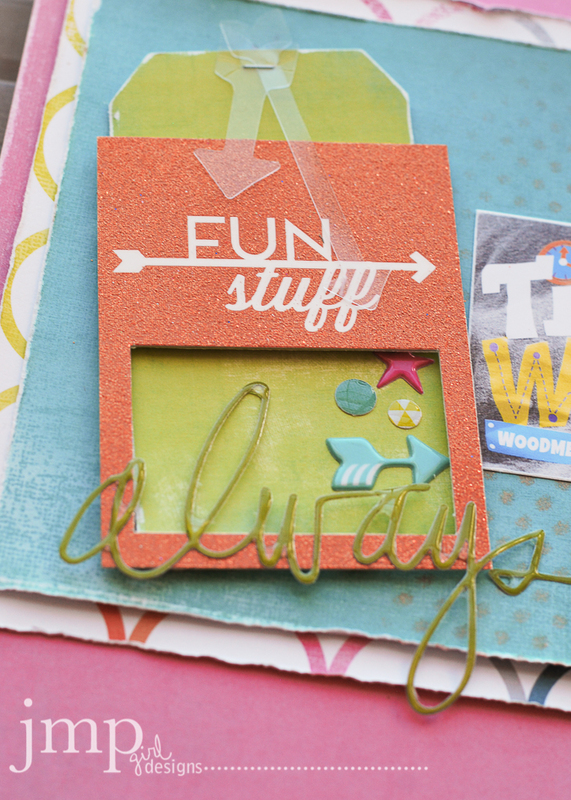 a few Enamel Stickers and Puffy Stickers peek through a bit and add to the fun. this project is an exercise in telling a very fun story and a meaningful moment in my daughters life. it is a bit of a creative stretch for me as i like to play it safe with softer tones, but played it up with all the color available here. and it give me an opportunity to share my words with this girl and try to slow the blur of her life a bit by sharing my love by way of creativity and words. hoping you found inspiration today. 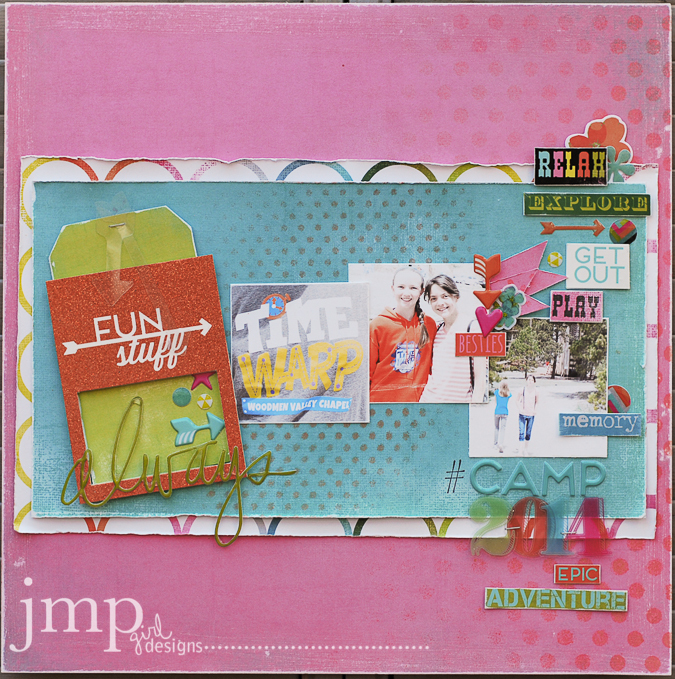 supplies: Favorite Things: 12x12 Paper Pad, Puffy Alpha Stickers, Glitter Frames,Ephemera,Word Jumble Stickers, Epoxy Stickers, Puffy Stickers. Stamp. This is just so lovely Jamie, I totally love that tag idea! brilliant!